We Cliftonites have a chance to invest in our shared future as an ever-evolving and forward-thinking community on Election Day, April 16. By voting “yes” to approve the Board of Education budget, we will be doing good for students and families. But by voting “yes,” the benefits go much further. A strong school system is at the foundation of an evolving and vibrant city. Good schools build strong communities, maintain property values, enhance local business and promote opportunity. These opportunities send Clifton High grads to top Ivy League schools, thousands to local universities and community colleges and others to the military, the trades and the local workforce. So what does voting “yes” cost? An additional $38.70 per year for a home assessed at $177,500. That’s $3.22 a month. While my four kids are long gone from Clifton Schools, I will be voting “yes” and hope you will as well. This is the first time Clifton voters have had an opportunity to vote on any budget since 2013. The proposed budget for 2019-2020 is $134,259,260 which is an increase of less than one percent over the prior year, so it is a modest increase with great benefits. 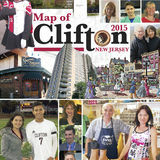 are distributed to hundreds of Clifton Merchants on the first Friday of every month. From top left: Gariel Delossantos, Adrian Matos, Captain Pete Wilk, Vinny Civitella, Josh Miller, Manny Gonzalez, Jayden Severino, Justin Rivera and Justin Severino; bottom row, from left, Captain John Labanich, Chris Stathopoulos, Nick Plaskon, Nick Stathopoulos, Dane Mocera and Josh Tejeda. Spring Sports by Tom Szieber The 2019 edition of Clifton baseball has the rare qualities of being youthful but experienced. The Mustangs are sophomore-heavy, with nearly all of their tenth-grade contributors coming into the spring having had quality playing time last year. The group missed the playoffs but did go 11-11 and advanced to the Passaic County semifinals. Not bad for a team that began the season 1-5. “Last year, I had no returning starters and I started bumping up freshmen,” said head coach Joe Rivera. “They already have a year under their belts and they’ve performed well on a big stage. They have swag, confidence. They feel good. They have talent and they have it all together.” Yet even with the strong sophomore presence, Clifton still has senior leadership in the form of second baseman Justin Severino and left-handed ace Pete Wilk. Severino will serve as the Mustangs’ cleanup hitter one season after earning all-county and all-league honors. Wilk is nursing an injury this preseason but will be a force on the mound upon his return to the field. Garden State Honda 4 MILES FROM GIANTS STADIUM! Honda Check Engine Light On? BASEBALL Sophomore right-hander/third baseman Justin Rivera will also be a key to Clifton’s success. A second team All-Liberty Division selection as a freshman, he was a key reason the Mustangs made it to the county semifinal. In the county tournament, Rivera notched a game-winning RBI single to beat Manchester Regional, nailed a 2-RBI double versus Pompton Lakes and had four hits against Hawthorne. “To have a freshman bat number three is huge,” Rivera said commenting on Rivera’s ninth-grade campaign. “For a freshman to play the way he did last year, with the game on the line, I want him up.” Sophomore Nick Plaskon will line up behind the plate. A well-rounded player, Plaskon blocks and receives well and has a solid arm. He is also a great contact hitter and bunter who will occupy the two-spot for Clifton. Fellow sophomore Vinny Civitella will play first base and pitch. Offensively, he is a power hitter who bats sixth. Their classmate, Dane Mocera, is the shortstop and has impressed Rivera with his ability to avoid errors. Senior John Labanich will play left field and pitch, as well, coming off a junior year in which he led the Mustangs in batting average and also earned first team all-county and all-league recognition. Sophomore Josh Miller will be in center field while the right field slot remains up in the air. Joining Wilk, Rivera, Civitella and Labanich in the rotation is sophomore Manny Gonzalez, who had the lowest ERA on the team a year ago. “Even though we are still very young we have a great chance at success,” Rivera said. “Returning almost everyone back from a team that reached the county semifinals, I am excited to see what we can accomplish.” And so are Mustangs baseball fans. Back from left: Amanda Bruno, Kate Louer, Virginia Ferreras and Taylor Panico; middle, Lily Zschack, Rebekah Villanueva, Chassidy Rodriguez, Liana Neumann, Nicole Weinbel, Sheilyn Serrano and Brielle Rodriguez; kneeling, Kyra Rodriguez, Aimee Hirst, Gianna Casillas and Grace Shukaitis. have played together through the rec programs and over the summer. The freshman and seniors are together. We have strong camaraderie and I hope we can put it all together.” Leading the way from the circle is junior Taylor Panico, who transferred from Passaic County Tech last year. Clifton’s most consistent pitcher, she can throw every pitch and is the squad’s hardest thrower, as well. She will be the Mustangs’ ace while three others—senior Kyra Rodriguez, sophomore Rebekah Villanueva and freshman Amanda Bruno—will compete for the two-spot. Mustangs Top left: Roberth Albarran, Eric Smith, Tyler Stilley, Kevin DePaz, Henry Zheng and Sunny Shastri; middle, Dennis Poventud, Steven Abreu, Justin Walker, Marcus Belmar, Daniel Partika and Khoi Nguyen; bottom, Ruben Salgado, Mohammad Nidaazi, Joshua Szabo, Eric Grimm and David Arroyo. The Clifton track teams come into the spring in two entirely different predicaments, with the girls boasting experience and the boys looking to reload. Still, both are hoping for an achievement-filled campaign. “We graduated an excellent senior class, but despite losses to graduation, we should contend for league and county titles again,” said head girls coach Mike Rodgers. “We do not have as much depth as we did in years past, but we will be serious contenders if we can stay healthy and focused.” The Mustang girls return the likes of sophomore sensation Mia Dubac who qualified for the Meet of Champions in both cross country and indoor track. During the indoor season, she broke a 33-year old school record in the 3200-meter and is one of the best distance runners in North Jersey. She will be joined by junior Andrea Dubbels, also one of the best distance runners in North Jersey, who broke a 33-year old school record in the 1600-meter run in during indoor season. A Meet of Champions qualifier during the winter, she is a returning state sectional champion in the 800-meter run. Together, Dubac and Dubbels are arguably the best distance duo in program history. NOW OPEN IN CLIFTON, NEW JERSEY! From top left: Inez Grullon, May Yuasa, Aylin Garcia, Nicole Alexander, Sarah Kusher, Natalia Gonzalez and Derly Castro; bottom, Cassidy Rubio, Arantxa Martinez, Brianna Rubio, Andrea Dubbels, Antoinette Muir, Leandra Nieves and Renae Austin. From top left: Steven Pedraza, Luis Morias, Luke Ceneri, Peter Fila, James Jackiewicz, Eddie Maldonado, Joseph Walker, Tommy Lyons, Lucas Urbanowycz, Nick Miller, Josh Rodriguez and Gregory Luna; bottom, Cole Ceneri, Enrique Montero, Alan Gonzalez, Jacob Maldonado, Michael Porter and Connor Sjosward. For George Cowan and Clifton boys lacrosse, 2018 was sort of average. The Mustangs finished the season 9-8 and were bounced from the playoffs in the first round, leaving them with a sense that they had unfinished business to be addressed the following spring. Now that spring has arrived, head coach George Cowan and crew believe that 2019 is poised to be season of progress for a team looking to take it to the next level—and past the opening round of the postseason. Senior midfielder Joe Walker will lead the way, coming off a junior season for which he earned first team All-Passaic County and first team All-Curcio Division honors. A shifty lefty, Walker can move with the ball and use his lanky frame to create points for the Mustangs. He led them in that category last year, scoring 31 goals and 20 assists. Junior midfielder Eddie Maldonado will be a key contributor in the midfield, as well. An all-county player at the position himself, he returns for a second varsity season having scored 22 goals and dishMustangs ing 13 assists in 2018. Possessing a strong rip offensively, he plays the box on defense. Jacob Maldonado and Luke Mustangs Ceneri, both freshman, round out the starting midfield while seniors Peter Fila and Gregory Luna and sophomore Enrique Montero will rotate in. Mustangs Junior Jack Louer will lead the offense a year after leading the team in goals with 34. Louer also notched 11 assists as a sophomore, and brings to the field a skill set Mustangs from the basketball court that allows him to play off the ball and succeed on pick-and-rolls. BOYS LACROSSE Hardworking senior Connor Sjosward will flank Louer on the offensive end, as will junior James Jackiewicz, who Cowan lauds for his mistake-free style. Senior Steven Pedraza is the anchor of the defense and will get support from junior Tommy Lyons, senior Michael Porter and junior Nick Miller. Senior Cole Ceneri will join them in the rotation. “Altogether, we have some guys with good stick skills,” said Cowan. “They have played together as a group for several years and I think that is the key to a defense.” Sophomore Alan Gonzales will start in the goal in just his second year playing the sport. Smaller in stature, he has impressed Cowan with his coachability and fearlessness. He has made impressive saves in preseason action and has the confidence of the rest of the lineup. “It is always interesting,” Cowan said “We aren’t deep in terms of a roster. But we have some real players, some kids who stood out last year. “I think we may surprise some people this year.” And, for fans of Clifton boys lacrosse, that is indeed good news. From back left: Jacob Wojdab; Emmanuel Sanchez, Gabriel Maksymiw, Anthony Meneses, Robert Lemanski and Jorgo Gerollari; front, Italo Huertas, Manav Patel, Adrian Baran and John Sendy Turqueza. Not pictured: Joe Lauritano. April 3 Front from left, Peter Lynch, Juan Vizcaino, Joey Velazquez, Johann Gamo, Justin Martinez and Jazon Suarez; back, Jonathan Martinez, Ali Muhammed, Omar Abufasha (Capt. ), Kevin Chavez, Sebastian Hernandez and Miguel Ariztizabal. Some see a struggling program. Shirah Wittwer sees potential. The Clifton boys tennis team limped to just two wins last year, hindered by low numbers and lower morale. But with the enthusiasm of their new head coach and support from athletic director Tom Mullahey, the Mustangs are hoping that 2019 can represent a year of rebirth for a team that has had its share of success over the years. “We really want to increase the numbers,” Wittwer said. “And I have tried to recruit some players from within our halls. We got 17 players to try out. We are going to try and build back a quality varsity program.” Wittwer, an assistant boys soccer and girls basketball coach, likes what she has seen so far. On April 16, from 130 to 8 pm, select three out of five candidates for a 3-year term on the Board of Education, a 1-year term commissioner, and vote the budget “up or down”. Meet the Board of Education Candidates With the BOE elections moved by judge’s ruling from Nov. 2018 to April 16, the following are condensed candidate profiles that appeared originally in our Sept. 2018 magazine. Read the full profiles at cliftonmagazine.com. Profiles of candidates Tafari Anderson and Franklin Montero can be found on pages 44 and 48. Dana Beltran, Joseph Canova, James Daley, Lawrence Grasso and Tafari K. Anderson are vying for a three-year term. Only three of the five candidates will be selected. Franklin S. Montero is running unopposed for a single-year term. Meet the candidates at a forum sponsored by the Clifton Republican Club on April 9 at 7 pm at the Clifton Elks Lodge. In our Mausoleum, pause, reflect and remember the lives of those who have passed. We’ve added a new section of Customized Glass Niches in our Mausoleum. Offering a focal point for your memorial service, our scattering grounds are private and can accomodate your family & friends. Our new columbarium is an attractive and meaningful place for families and friends to memorialize their loved ones after cremation. New plots have been added offering exceptional landscaping and beautiful views of the NYC skyline. Filmmaker Frank DeLorenzo of Clifton and above, the poster for the 2019 Festival. This year marks the 15th anniversary of the Passaic County Film Festival, with Cliftonites well represented. The festival is an exhibition of student and independent filmmakers’ work, featuring projects created by those who live, attend school or work in Passaic County. Along with providing a showcase forum, the festival is an opportunity for filmmakers to have their work reviewed and screened in a professional venue and interact with industry members. One of those talented filmmakers is Clifton’s Frank DeLorenzo.“Growing up,” said DeLorenzo, “I was obsessed with movies and how they were made after my mom showed me the behind the scenes featurette of Michael Jackson’s The Making of Thriller.” A 2006 CHS graduate, DeLorenzo studied marketing at Bergen Community College and William Paterson University, hoping to create commercials for a career. 15th PC Film Festival Ambrose, a 2017 CHS graduate. “They both try to figure out how to let one another go. [The film is] actually very similar to the high school short film I made called First Love. I’ve finally retold the story in its entirety.” Ambrose, 20, is now a sophomore at Montclair State University, majoring in business (with a concentration in data analytics) and minoring in film. April was also screened last month at the Lovesick Film Festival in Jersey City. Festival films are judged in the following categories: General Short Film; Public Service Announcement; Documentary; Music Video; and Silent Films. Along with recognizing work by local independent filmmakers, the festival also screens work by high school and university students. Among the Passaic County Technical Institute students living in Clifton who will screen their films at the festival are Emily Morillo, who will present Love Redefined, a story that asks young teenage girls about self-love. Classmate Megan Mitchell, whose film The Missing Piece, explained the difficulties of Autism in a PSA she produced. A music video by Clifton resident and PCTI student Jariana Roberts on Suicide Prevention (1-800-273-8255) was among the more memorable films carrying an important message and will be among the 20 films screened. However, due to time limits, not all the films could be shown. While all 79 festival entries have been reviewed, only the top-ranked entries in each category, selected by Passaic County Film Commission member judges, are screened. “I wish we could screen each and every one of them,” said Deborah Hoffman, Director of the Passaic County Division of Economic Development. “I think it is amazClifton filmmaker David Ambrose. PCTI Filmmakers Jayden Hunt, Samantha Olson, Emily Morillo, Megan Mitchell, Asia Brown and Matt Sillen. Not pictured but who also participated and are Clifton residents, Jariana Robertson and Jozmarie Irizarry. film makers from Passaic County,” Freeholder Director John Bartlett said. “This is the 15th year of our sponsorship of the film festival, and we are delighted to give County film makers an opportunity to share their films with the public. “This year’s film festival should be special as we feature the NJ Symphony Orchestra Chamber Players.” A $2,000 Doris Aaronson Award will also be presented to the filmmaker with the best social or environmental film. The Passaic County Film Festival begins at 10 am on April 13 at the Fabian 8 Cinema. The Fabian is located on the upper level of Paterson’s Center City Mall at 301 Main Street (Main and Ward Streets). A voucher for the underground parking garage at Center City Mall will be provided to attendees. Admission is free and it is open to the public. The festival is sponsored by the Passaic County Board of Chosen Freeholders with additional financial support from a grant administered by the Passaic County Cultural & Heritage Council from funds granted by the New Jersey State Council on the Arts; Accurate Box; Bascom Corporation; Carl “Doc” Burrows; Cristina Deutsch; Jody Lazarski; Lakeland Bank; Maryellen Lyons; The North Jersey Federal Credit Union; Passaic County Community College Foundation; PSEG Foundation; Ross International; Unique Photo; and Valley National Bank. Marie Nigara, her daughter-in-law Gina, Melissa Goglia, Cupoli and his son Joseph holding Juliet Nigara and her brother Theo. rented movies from the library and set up my basement as a movie theater. We had a bunch of games outside for a nickel and gave out prizes.” The only son in a Polish-Italian family of five daughters, Cupoli could not recall why they picked the shelter to support, though the family always had pets. However, the giving spark was born. “I always felt,” he said, “if I Giving Nature had the ability, I was going to help When he was 10, Joe Cupoli people. As I’ve gotten older, the began making a difference in his helping has gone on to a larger Cupoli’s uncle Stephen Horoschak. community. scale.” With his sisters, he organized After graduating Bloomfield a fair at his Bloomfield home to High in 1982, Cupoli earned an benefit the local animal shelter. The Independent industrial engineering degree at NJIT. While in colPress wrote a 1975 story, “Fun at the Fair,” detailing lege, he began working at P&A Auto Parts and would how the Cupoli siblings raised $50 for the shelter. go on to buy the business with partner Bill Friedman “I went around to ShopRite, Garden State Farms in 2003. They now have nine store locations throughand other local business, and got small donations,” out Passaic, Bergen and Essex Counties, and employ he remembered. “We did a fun fair in my backyard. I more than 150 people. After he supported Holmdel’s Ivy Charmatz’s Woman of the Year drive last year, Charmatz nominated Cupoli to undertake his own campaign. “I was blown away by the LLS organization—how well it’s run, where the funding goes. The donated money is so well used—78 percent goes to patient services and research, and just 22 percent to administrative costs. Last year, 14 of the 17 approved drugs came from blood cancer research.” Not only do LLS-supported therapies help blood cancer patients, they are now used to treat patients with rare forms of stomach and skin cancers, and noncancerous diseases such as rheumatoid arthritis and other autoimmune diseases. With his team of 22 friends and family—selected so their social circles do not overlap—Cupoli is aiming to raise more than $250,000. Cliftonites on his team include son Joe, the BOE’s Kim Renta and WWMS teacher Melissa Goglia. “I’ve been on national calls,” he said, “with doctors who make the decision about where the funding foes. 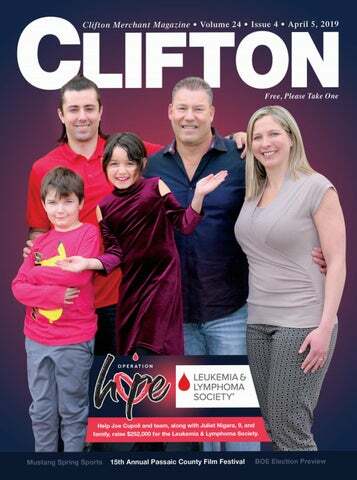 The way they pinpoint the cancer treatment and research is incredible.” Cupoli’s campaign runs through June 5, and he would appreciate support from his large network of Clifton friends. “Each of us has been touched by cancer is some way, shape or form,” he said. “I’m excited about this opportunity to do something special and impactful.” To help Joe Cupoli and Operation Hope raise money for LLS during his Man of the Year campaign, visit operationhopells.com. ARTS & MUSIC Ever have a guest who you can’t wait to leave? That is the premise behind the comedy ‘The Man Who Came to Dinner,’ presented by the Theater League of Clifton. Set in the 1940’s, the central character is Sheridan Whiteside, an opinionated radio personality host who falls and becomes the univited guest of the Stanley family. Performance dates have been changed to May 31, June 1, 2, 7, 8 and 9. Cliftonites Elizabeth Eisenmenger (left), John Traier and Dorothy Dobkowski are among the performers in the play, staged at the Aprea Theater. To reserve tickets call 973-928-7668 or visit theaterleagueofclifton.com. The Bloomfield Mandolin Orchestra is saddened by the loss of its beloved and longtime member Carol Franz, 80, who passed away at her home in Glen Ridge on March 2. Franz, second from left, not only performed with the group but also served as orchestra president and treasurer. Many will also recognize her from her decades of work at the Clifton Immedicenter where she was the business manager. A Bloomfield Federation of Music Hall of Famer, Carol and husband Jack also represented the orchestra at several national Classical Mandolin Society of America conventions. Pictured from left with Carol in a 2007 photo are Russ Kelner, Gabriel Nevola, Janet Wells and Dr. Phil Jasper (photo by John Meixner). School 11 fifth grader Isabella Frias had her long hair cut on March 18 as part of the 14th annual Cut-a-Thon at Christopher Columbus Middle School. In total, students, staff and friends had 1,713 inches of hair cut and donated to the Children with Hairloss CWHL. These donated locks will be used by kids who lost hair due to illnesses, reports organizer and CCMS teacher Kim Dreher. Jason Boyko, 12, placed first in the Special Olympics Bowling State Finals March 24 representing Team PRAISE, winning a gold medal. Pictured with Jason are his proud coaches, Melvin Chance (left) and Robert Marriello. Clifton Cares has shipped more than 5,000 packages to our troops serving overseas since it first began in August 2010, and volunteers need your contributions. Deposit items in bin at city hall. Make your tax-deductible check payable to Clifton Cares Inc. and mail to Clifton Cares, Clifton City Hall, 900 Clifton Ave., Clifton 07013. Clifton Cares is a 501(c)(3). Power of One’s “Hunger Doesn’t Stop Spring Break” Food Drive is On March 20, the Passaic County Coaches Association feted coaches for achieving being sponsored by Kearny Bank. milestone wins. Among the honorees were (from left) Stan Lembryk, soccer, 200 Since schools are closed during wins; Joe Rivera, baseball, 100 wins; Amanda Gryszkin, service award; John Ponspring break, families depending tes, track and field, 150 wins; and Dan Geleta, wrestling, 200 wins. on their school’s reduced or free lunch need help with weekly groThe Clifton Advisory Committee for Individuals ceries. Help by donating non-perishable food items, and with Disabilities meets the third Monday each month drop off your donations at Kearny Bank’s branches on in the City Hall Health Department offices at 6:30 pm Clifton, Lakeview and Van Houten Aves. Visit www. (public is welcome). The organization reminds all to powerofoneccom.org for more details. To organize a obey the law and leave handicapped parking spaces for food drive, contact Kim Castellano at 201-328-2326 or those who need them. For committee info, visit cliftonkim@powerofoneccom.org. nj.org/content/individuals-with-disabilities-and-special-needs or contact Colleen H. Murray at 973-253St. John Lutheran Church at 140 Lexington Ave., 9579 or czarinahelenaone@gmmail.com. Passaic will hold a thrift shop on April 6 from 9:30 am to 1 pm. Gently used clothing, household items, toys, Send info on events to tomhawrylko@optonline.net and games will be featured at a very low price. and we’ll publish as space and time permits. Clifton Public Schools annual All-City Band Concert was at the JFK Auditorium in Clifton High on March 19. Each year students from the fifth through 12th grades have the opportunity to audition to become part of the “All-City” ensemble. They are chosen based upon several different criteria including high performance scores, maintaining a high level of responsibility and a continuous practice ethic. Above left, Marching Mustang sophomore clarinet player Christine Delguercio, Dominic Yang, Colin Nash, Muntaser Atyieh, Ella Carlo (all from School 3), with CHS Marching Mustang senior baritone horn player Gabriela Gaspar. Others pictured on this page are unidentified but certainly enjoyed performing. The Trio Fontes chamber ensemble— violinist Yevgeniy Dyo, cellist Suji Kim and pianist Sojung Lee—will perform at the Main Library April 30 at 7 pm. Sponsored by the Friends of the Clifton Public Library, concerts are free. For info, call Denise Regalado at 973-777-7883. Clifton Rec Dept.’s “Bunny Bash” is April 13 from 9:30 to 11:30 am at Nash Park on Lexington Ave. Prior to the event, there will be breakfast with Mr. Bunny from 7:30 to 9:30 am at the Hot Grill directly across the street. At the Bunny Bash, children (3-12) can visit Mr. Bunny, go to Mrs. Bunny’s Playstation and take part in the 13th Annual Easter Bonnet Contest and Parade. Children ages 8-12 can also participate in a Bunny Hop (pogo sticks supplied). This event takes place rain or shine. For info, go to cliftonrec.com. The Boys & Girls Club of Clifton will host its 12th Annual Tricky Tray May 10. Sponsored by the Ladies Auxillary, proceeds go to the Club’s operational costs. Donations of prizes or sponsorships are greatly appreciated. For info, call 973-773-2697 x143. A Jigsaw Puzzle Contest will be held April 23 at the Community Recreation Center at 1232 Main Ave. Doors open at 5:30 pm and the contest runs from 6 to 7:30 pm. Teams of friends or families compete to see how fast they can complete a 300- or 500-piece puzzle. Registration is required and can be done online (by 4/19) or at the Clifton Rec office. Soda and juice provided. Cost is $5 per team. For info, go to cliftonrec.com. When JAG-ONE Physical Therapy cut the ribbon at 50 Mt. Prospect Ave. in Clifton on March 11, it marked its 40th location in the tri-state area. Pictured from left, Councilman William Gibson, Joseph Saraceno, PT, chief operating officer of JAG-ONE Physical Therapy, Casey Boullitier, clinical director of the Clifton location, Mayor James Anzaldi, John Gallucci, Jr. MS, ATC, PT, DPT, chief executive officer of JAG-ONE Physical Therapy, Mike Evangelist, vice president of Clinical Services. At the Feast of San Giuseppe on March 23, from left are Vincenza’s daughter Sarah Lombardo, son Joe DeLiberto, guest Mayor Jim Anzaldi and daughter Adeline DeVries. At right, CHS Class of 1954 is planning its 65th reunion, and organizers want classmates to contact them ASAP with their names and addresses. The reunion will be held in early June at the Bella Napoli on Broad St. in Bloomfield. Contact (from left) Rita Foti at 908-475-2945, Bill Hansen at 973-661-1034 or wrhLabs@gmail.com or Barbara Den Herder at 973-471-3078.
saved her mother from death by pneumonia. DeLiberto’s mother lived for many years after. This year’s feast was attended by about 80 people. CHS Class of 1970 is looking for the info on class mates, such as mailing addresses, emails and phone numbers. Ann Marie Ayers-Williams is beginning the planning stages for the 50th reunion on Oct. 11, 2020. Send your info to clifton1970reunion@gmail.com. CHS Class of 1979 has its 40th reunion on Nov. 16 at the Black Bear Golf Club in Franklin, N.J. Tickets are $79 and must be purchased by Sept. 1. To request a registration form, email Debra Hatem Gorny and Linda Haraka DiFalco at chs7940years@gmail.com The Clifton Elks Lodge at 775 Clifton Ave. is hosting a “Fish & Chips Dinner,” April 19, from 5-8 p.m. Dinner is $10 per person, eat in or takeout. For more info, call 973-473-9752 or email cliftonelks@optimum.net. The 15th Annual Relay for Life of Clifton is May 18 from 4 pm to midnight at Clifton Schools Stadium. This year’s theme is “Going 15 Rounds with Cancer.” Relay for Life brings the community together to help create a world with less cancer and more birthdays. For info, go to relayforlife.org/cliftonnj. To learn more about fighting cancer, call 800-ACS-2345 or visit cancer.org. PANCAKE DAY Clifton IHOP’s Kevin O’Neil turned out the servers, cooks and thousands of pancakes on March 12 to Flip it Forward for Kids. Along with IHOPs nationwide, they served up free short stacks of buttermilk pancakes. Customers were then asked to make a donation to help children battling critical illnesses, earning thousands for the cause. On March 8, Woodrow Wilson Middle School was named a Unified Champion School by Special Olympics. “We strive to promote an inclusive environment for all our students and are thrilled to be acknowledged by this wonderful organization,” wrote 6th grader teacher and coordinator Angela Fatsis at the banner unveiling. GIFTING THE CLUB St. Philip The Apostle, Knights of Columbus members, surrounded by students and Club members presented a donation to the Clifton Boys & Girls Club. The K of C, a Catholic men’s organization dedicated to charity, is open to any Catholic man over age 18. To become a member, call Grand Knight Rich Donkersloot at 973-650-332. St. Mary Ukrainian Orthodox Church at 81 Washington Ave. will host a “Ukrainian Easter Egg (Pysanka) Decorating Class,” April 10, 6-8 pm., at the church hall. Class fee is $15 and includes eggs and supplies. Register by April 8 by leaving your name, number of students and telephone number on the church answering machine at 973-546-2473. The kitchen feature homemade perogies and Ukrainian-themed gifts for sale. Young at Heart Club Meetings are held on the first and third Wednesday of each month at the Masonic Lodge, 1476 Van Houten Ave. Refreshments are available at 11 am, followed by a brief meeting at noon. Bingo is available. Upcoming trips include: April 12, Tastefully British-Fish & Chips: Luncheon by AARP 4192 & Young at Heart Club at Masonic Lodge, take-out available. Call Lillian for info 973-779-5581. Clifton Parents Requiring Action and Information for Special Education (P.R.A.I.S.E.) is a non-adversarial parent support group for parents/families with special needs children and adults based in Clifton. Their next meeting is April 22 at 6 pm at the Allwood Library. Gary Weitzen of POAC Autism Services of NJ will be presenting Hidden Dangers and How to Keep Individuals with Autism Safe in Home, School, and Community. Registration is encouraged through www.poac.net. For more information, email cliftonpraise@gmail.com. Celebrate the grand re-opening of Clifton Arts Center on April 10 from 4-8 pm with the exhibit, “Picturing Open Spaces and Places.” The exhibit aims to increase appreciation of Passaic County’s urban, suburban and rural settings. Admission is $3. The Clifton Arts Center and Sculpture Park is on the City Hall grounds. Info is available through the city’s website at cliftonnj.org. St. Peter’s Haven is presenting its “Bloomin 5K Run & 1 Mile Walk” on April 14 from 8-11 am. St. Peter’s, assisted by the Clifton Road Runners Club, is hoping for 500 runners/walkers to arrive at 7-7:30 am at Clifton Schools Stadium to start the race and raise money for the city’s hungry and homeless. For info, visit Bloomin5K.org or cliftonroadrunners.com. Members of the Clifton/Passaic chapter of the UNA: Maria Drich, Marie, Duplak, Eliane Ilnitski, Rev. Andriy Dudkevych, Vasyl Harhaj, Halyna Semenyak, Stefan Zurawski and Nadia Dovhan. celebrate, including a restructured youth scholarship, as well as charitable giving. The anniversary finale will be a grand concert, “Celebrating 125 Years!” It will be held Nov. 2 at the Dolan Performance Hall on the campus of College of St. Elizabeth in Morristown, N.J., and feature performers from the U.S., Canada, and Ukraine. Info about the UNA and its 125th anniversary can be found through UNA publications Svoboda and The Ukrainian Weekly, both in print and online (svoboda-news.com and ukrweekly.com), on the UNA website (unainc.org), as well as by following Ukrainian National Association on Facebook. Nearly a century ago, Clifton relied on an economic engine of mills and workers, many who lived in Botany Village. For city resident Helen Berkenbush, those times came alive again as she catalogued Botany’s unique history. In 2017, the Passaic County Historical Society received a collection of materials related to Botany Mills of Clifton/Passaic and Forstmann Woolen Company of Passaic/Garfield. The collection was given by the now-closed American Textile History Museum in Massachusetts. Berkenbush, 80, had the task of inventorying the collection along with other volunteers. It included three skids of material—264 boxes of sample books, pieces of cloth and some weaving hand tools, with the vast majority relating to Botany Mills, for which Botany Village was named. tion with the Dundee Falls. The resulting Dundee Water Power and Land Company provided water and power for the factories. “In the 1920s,” Berkenbush wrote, “there were over 16,000 workers employed in the wool and silk mills located in and around Passaic. This workforce represented over 39 nationalities and approximately half of the employees were female. The largest, Botany Worsted Mills, employing 6,400 workers.” The fabric swatch books date to 1901-55 and contain an array of colors, tweeds and plaids that reflect the changing fashion of the times. “In its heyday,” Berkenbush wrote, “Botany 500 Suits for men were made of fine woolens and worsteds sold on Broadway in New York City. The company’s advertising brochure, Botany: An American Institution, details several other products for men, women and children including wrinkleproof ties, beachware and Lanolin cosmetics.” For her article, Berkenbush spoke with noted WWII veteran and Cliftonite Walter Pruiksma, who now resides in Brick, N.J. Pruiksma worked as a quality control examiner for Forstmann Mills and later became a leading salesman. He said employees working in the processing of the woolen goods were sworn to “need to know” access to their factories, keeping the processes secret (the same was true for Botany Mills). “During World War II,” Berkenbush wrote, “the tan fabric for all the Naval Officers’ uniforms were made by Forstmann Mills.” Berkenbush also uncovered significant Marching Mustangs history through Pruiksma, who said Botany Mills had a company band. When it was disbanded in the late 1930s, the instruments were donated to the Clifton Public Schools. “In 1938,” she wrote, “the Mustang Band at Clifton High was established with these instruments.” To house Botany and Forstmann Mills employees, Clifton developed an area along the river called Botany Village (a similar development along Passaic’s Dayton Ave. was also established). “The Mills in the Botany Village neighborhood,” Berkenbush wrote, “are protected as part of the Dundee Industrial Historic District.” Quotes from Helen Berkenbush’s article are reprinted courtesy of the Passaic County Historical Society, Paterson, N.J. Her article was first printed in The Historic County: Newsletter of the Passaic County Historical Society, Vol 18, Issue 4 Fall 2018. More Memories of Botany In 2006, former city historian Bill Wurst wrote of his walking tour through Botany in Clifton Merchant Magazine. “A flood of memories,” Wurst wrote, “cascaded into my consciousness... factory whistles piercing the morning stillness; voices speaking a rainbow of different languages; the sweet smell of jelly donuts from Heck’s Bakery on Highland Ave... “I could almost smell the strong aroma of cigar smoke from taverns as I rode by on my bicycle and see sidewalks crowded with workers dashing off to the Botany and Forstmann woolen mills or the throngs of Friday night shoppers. “Those woolen mills were largely responsible for both the shoppers and the retailers who served them. Through the 1950s, Botany’s prosperity depended on the financial well-being of those factories. I was fortunate to live in Botany for a while before the mills closed and ‘moved south.’ “I can still see the many faces of my neighbors and friends in those days and the vibrant and close knit community that we lived in.” Historic Botany Village continues to grow and thrive. Go visit the district while you shop, stroll and enjoy. Find out more at historicbotanyvillage.org. Freshman Hilary Amoh, Sophomore Ahuva Over, Junior Joshua Szabo, Senior Omar Abufasha. April has arrived for Mustangs of the Month. Alice Shanley Babinski...... 4/12 Josh Ontell....................... 4/13 William Parks III................ 4/13 Alexander John Mosciszko. 4/14 Lisa Kulesa....................... 4/15 Adam Pienciak................. 4/15 Kurt Irizarry...................... 4/16 Robert Monzo.................. 4/16 Linda Humphrey................ 4/17 Joseph P. Koribanics.......... 4/17 Peter Fierro....................... 4/18 Maura Coleman............... 4/19 Jason Dubnoff................... 4/19 Jennifer O’Sullivan............ 4/19 Bryan Rodriguez............... 4/19 John Anderson.................. 4/20 Jeff Camp........................ 4/20 Greg Nysk....................... 4/21 Alicia Rose Aste................ 4/22 Frank and Lee Robinson will be celebrating their 61st wedding anniversary on April 12. Doreen Delancy-Williams celebrated her hometown in so many ways, from her work as a realtor to her volunteer efforts on the Clifton Board of Recreation. When the lifelong Clifton resident and CHS (’75) grad passed away last year on April 9, her friends, family and fans vowed to fittingly celebrate her life and create a legacy. So this year, on April 28 at 2 pm at Robin Hood Park, 23 Standish Dr., there will be a “celebration of Doreen’s life” and the community is invited to share memories of her as a plaque and bench will be unveiled in Doreen’s name. A 24-year Board of Recreation commissioner and grand marshal of Clifton’s 75th Anniversary Parade in 1992, Doreen’s family owned Delancy Mens Store in Botany Village for decades after its founding in 1915. “Doreen was a super volunteer,” said Mayor Jim Anzaldi, “and had a great love for Clifton. I met her when she was volunteering as a teenager—she was hand-drawing posters to advertise the city picnic.” Doreen was a Clifton Youth Week chair and led the Youth Week Talent Show for more than a decade. From the July 4 fireworks to MCing the Halloween Parade, she did much for Clifton. “She really knew how to celebrate things,” said Anzaldi. “Doreen worked to build Clifton up and never to tear it down. Even when she wasn’t feeling well, she still participated in events any way she could.” As a realtor, her tag line was Doreen Delivers Dreams. She not only did that in business life, but also to the city she loved. “Doreen is greatly missed,” said Anzaldi. Call today & Start Packing! LIVING ROOM WITH FIREPLACE, MODERN EAT-IN KITCHEN WITH GRANITE COUNTER TOPS & STAINLESS-STEEL APPLIANCES, DINING ROOM, FLEX ROOM & FULL BATH ON 1ST FLOOR. 2ND FLOOR WITH MASTER BEDROOM AND BATH, WALK IN CLOSETS. ADDITIONAL 2 BEDROOMS AND FULL BATH. FULL BASEMENT. 2-CAR GARAGE. IN THE DESIRABLE MONTCLAIR HEIGHTS SECTION. OFFERS LIVING ROOM, DINING ROOM, WORK IN KITCHEN WITH ADDITIONAL COUNTER SPACE, MASTER BEDROOM WITH MASTER BATH AND DOUBLE CLOSET, PLUS ADDITIONAL BEDROOM & FULL BATH. HARDWOOD FLOORS. CENTRAL AIR. LAUNDRY ROOM. OWN YOUR OFFICE CONDO FOR APPROX $2,475/MONTHLY, WHICH PAYS TAXES, MORTGAGE & INSURANCE. CONVENIENTLY LOCATED IN A SHOPPING & OFFICE COMPLEX. 1,586 SQ FT PROFESSIONAL OFFICE CONDO, PREVIOUSLY USED AS A DOCTOR’S OFFICE. CONSISTING OF 2 UNITS. MAINT. & UTIL. APPROX. $1,074/MONTHLY. SET WITHIN 7.06 ACRES OF PURE NATURE & TRANQUILITY WITH PILLAR ENTRANCE AND 1ST FLOOR OFFERS LIVING ROOM, FORMAL PRIVATE ROAD. PAVER PATIO & DINING ROOM, MODERN EAT-IN-KITCHEN WITH GRANITE COUNTER TOPS & STAINLESS- CAPTIVATING VIEWS. LIVING ROOM WITH STEEL APPLIANCES. 2ND FLOOR WITH MASTER FIREPLACE, FORMAL DINING ROOM, KITCHEN WITH BREAKFAST ROOM WITH BEDROOM, WALK-IN CLOSET AND MASTER LARGE WINDOWS, LOTS OF STORAGE & BATH. ADDITIONAL BEDROOM WITH FULL BUTLER’S PANTRY. 5 BEDROOMS & 6 BATHS BATH. FAMILY ROOM IN GROUND LEVEL. HARDWOOD FLOORS. A MUST SEE! FEATURES LARGE LIVING ROOM AND SEPARATE DINING ROOM, OPEN TO BRAND NEW KITCHEN. BRAND NEW FULL BATHROOMS. BRAND NEW ROOF. NEW FURNACE AND WATER HEATER. NEW HARDWOOD FLOORS THROUGHOUT. BLOCK AWAY FROM PLAYGROUND. FINISHED BASEMENT WITH EXTRA OFFICE.